Fly.com is the simplest way to find the right flight at the right price. Fly.com is an airfare search engine that makes looking for airfares both quick and easy. 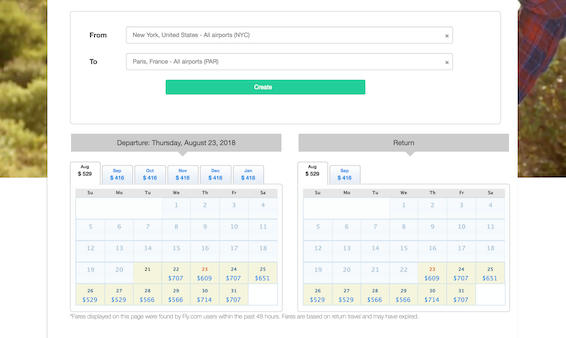 When you use Fly.com, the site searches hundreds of airline and major travel sites for real-time fares, and then presents the results in a simple, clean and easy-to-understand format. We even include taxes in the fare prices so you can quickly see the total cost. Fly.com searches major domestic and international airlines, including low cost airlines, and even online travel agencies and airfare consolidators. Why is this important? The breadth of the sites we search helps make sure we present you with the very best fares. From companies like Travelocity to JetBlue to many lesser-known discount sellers in between we want to make sure you find the best deal. Our fare calendar shows you the best fares on a given date, not 30 days, not 90 days but a full 180 days out from today. You can quickly see the price for departure and return. Now you can see if Tuesday is cheaper then Saturday or if Sunday is better then Friday, the best in class Fare Calendar is here to server you every day. We help you decide which flights are right for you, and show you where to book. When you find the right flight simply click on the “select” link to be taken directly to the supplier’s Web site. Finally, if it isn’t obvious, we don’t force you to sign in to our site, and we don’t charge you for our service. We make our money from our partners and advertisers. Fly.com’s mission is to simplify airfare search. At Fly.com, our goal is to cut through the clutter and confusion and create the simplest way to find the right flight at the right price. What is it about Fly.com that makes us stand out?